The Library will close at 1 PM on Wednesday, November 26th. We are sorry for the inconvenience. The motto of Librarians’ Internet Index is “Websites You Can Trust.” Updated weekly, this is an extensive database of websites on every subject under the sun, individually selected by librarians for their usefulness and reliability. With over 20,000 websites indexed, there are plenty to choose from! These include all kinds of trustworthy sites from government, academia, associations, and other sources. The LII home page usually features links related to current news and holidays. LII is one of my favorite resources and a great way to find reliable websites quickly! Here are some of the books and videos we added to our collection in the first half of November. You’ll find these and other great titles in our catalog, MnPALS Plus. You can also find invaluable, extensive and trustworthy information from Web sites put up by professional organizations and associations (examples: American Psychological Association, Minnesota Nursery and Landscape Association), as well as sites related to programs heard on National Public Radio (like “All Things Considered”) or seen on public television (NOVA science programs.) These fine Web sites can be excellent supplements to books and journal articles as research sources. But, as every instructor knows, there’s also a lot of unreliable junk on the Net, as well. After all, anyone with a computer can put up a Web site. And when students simply Google their way through a research project, the results can be discouraging. So, given the mixed bag in the Web world, how do you sort the wheat from the chaff? In a short series of short blog entries, I’ll present some tips to make your Web searching easy and fruitful. Look for the first installment next week! Here are some of the books and videos we added to our collection in the last half of October. You’ll find these and other great titles in our catalog, MnPALS Plus. I just received this update from Facts On File regarding our Science Online subscription. Check it out! This update includes many new features and records that tie current events to the study of science and also provide support to educators who will start preparing soon for final exams and science fair competitions. 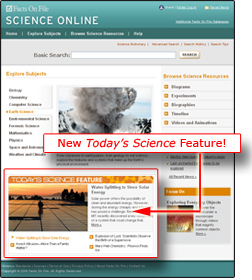 Check out our new Today’s Science and “Focus On” features on the home page, 60 new experiments, more than 125 new videos, more than 440 new and updated illustrations and photographs, and more than 100 new essays. The new content covers everything from artificial intelligence to tsunamis and the hydrosphere. Continue reading for more details about this update. Water-Splitting to Store Solar Energy: Learn about the challenges of storing solar power efficiently and cheaply. Insect Altruism-More Than a Family Matter? : Read E.O. Wilson’s observations about insects such as worker bees, group selection, and evolution. Explosion of Luck: Scientists Observe the Birth of a Supernova: Find out how scientists discovered the X-ray pattern that signals the birth of a supernova. Click here to visit the home page and check out this new feature. Science of Ice and Snow: How Do You Photograph a Snowflake? How Trees Get Water and Nutrients. 2009 will be here soon and we’ll need to discard old magazine and journal issues to make room for new ones. Please see this Excel spreadsheet of the issues we’re getting rid of and contact us if you’d like any of them. Thanks! In the final run-up to the 2008 election, here’s a set of informative and fascinating web links regarding the upcoming election. You’ll find clips from the debates (searchable by topic discussed), candidate interviews, news stories, background and analysis, and more. This comes from Librarians’ Internet Index, a wonderful compilation of trustworthy Web sites. Here are some of the books and videos we added to our collection in the first half of October. You’ll find these and other great titles in our catalog, MnPALS Plus. Welcome from the Reference Librarian! Instructors: I am happy to do library/research orientations for your classes and can adjust my schedule to fit your class meeting times. These are information-packed, hands-on sessions held in the library’s classroom. You can find me at the Reference Desk in the Library, phone me at 651-423-8345 or e-mail me at Barbara.Tuttle@dctc.edu.